Packing a well-balanced lunch can be a challenge. I recently got married and now I’m packing two lunches every single day! So, I came up with a prep-ahead method for making packable lunches with healthy dairy products much simpler—the Balanced Bowl. By now, most people have tried trendy quinoa, but have you tried farro? This Italian ancient grain boasts a pleasantly chewy texture and a slightly nutty flavor. It’s also high in protein and fiber. Bulgur, whole-wheat couscous, pearled barley, and brown rice are also good options. Cook a large batch of one or two grains on Sunday to make meal prep easier throughout the week. The Dietary Guidelines for Americans recommend adults get at least 1 1/2 cups of dark green vegetables each week. Vary your greens and try baby kale, arugula, or mustard greens in addition to the more common spinach and lettuce varieties. Consider options you can prepare ahead. For example, bake extra chicken breasts on Sunday, or cook extra pork tenderloin for dinner on Wednesday to add to bowls later in the week. If time is short, choose canned tuna, frozen shelled edamame, canned beans, or chopped boiled eggs. You can never have too many vegetables! In the summer, add fresh tomatoes and cucumbers, or during the winter, add raw or roasted carrots and fennel. For a rich and flavorful addition, add caramelized onions or sautéed mushrooms. Vegetables not only add a dose of vitamins, minerals, and fiber, but they can also add a big punch of flavor. Top off your bowl with one serving (1/4 cup) of shredded or crumbled cheese, which provides protein and additional health benefits of dairy. If desired, add a second savory topping, like dried cranberries for a sweet note, or chopped toasted nuts for added heart-healthy fat and crunch. In a separate small container, pack about 2 tablespoons of your favorite dressing. Make your own dressing to reduce the amount of sodium. If you prefer a creamy dressing like ranch, make your own using plain Greek yogurt to cut calories and saturated fat and boost bone-building calcium. Did you know that Greek yogurt has twice as much protein as regular yogurt? 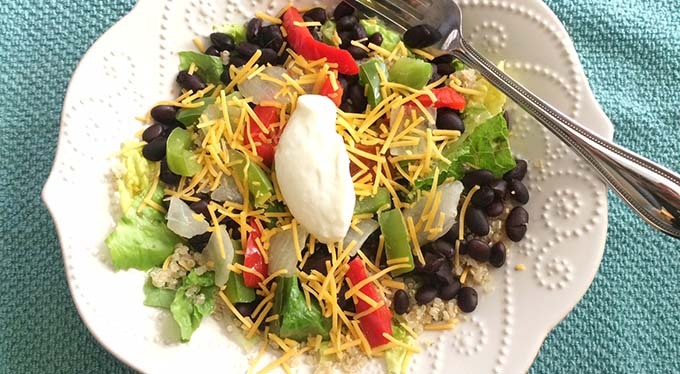 Try a Mexican lime yogurt dressing by combining 1/2 cup nonfat plain Greek yogurt, 1/4 cup olive oil, 1 tablespoon lime juice and 1/2 teaspoon minced garlic for a zesty, creamy option. 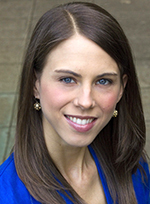 Jessica Cox is a Registered Dietitian and chef with a passion for teaching people to eat healthy for a happy and delicious life. Her writing and original recipes have been featured in Cooking Light magazine, Kids Eat Right website, Local Table magazine, and several Oxmoor House cookbooks.